Business Property Relief (commonly known as ‘BPR’) is, in many ways, the jewel in the crown of Inheritance Tax Planning arrangements. Why? Because it is simple, generally non-contentious, effective over a short term and often comes with other tax savings benefits. The video below introduces Tony Wickenden who is an expert technical consultant on estate planning and inheritance tax. The video made by Octopus Investments explains the benefits of using Business Property Relief to mitigate Inheritance Tax . To get the relief the relevant property/investment must be held for a minimum period of 2 years. Our focus is on helping people find suitable investments which qualify for BPR as part of a wider plan to reduce Inheritance Tax, in this respect and for the purposes of this article we will concentrate on the 100% relief that can be obtained from investing into unquoted shares. If you have wealth which takes you over the IHT allowances you may benefit from making an investment into unquoted shares and then holding these shares for a minimum period of 2 years. If you still hold the shares on your demise the value of the investment would be free of Inheritance Tax. Looking at this simplistic example you can see therefore that BPR works as described at the top of this article: simple, effective, creating a significant tax reduction after just 2 years. Compared to other measures to reduce the potential IHT liability it works wonderfully well. However, we know if something looks too good to be true it normally is, so what are the pitfalls? The most obvious pitfall is that any investment of this nature (unquoted shares) comes with risk and it would be sensible to consider the risk of unquoted shares as being high on the risk scale. – A number of BPR qualifying investments of this nature are now offered via discretionary management services. These allow for a basket of unquoted shares to be held within the one investment structure (and amount) and as with any spread of this nature, by holding the shares collectively the diversification reduces the risk. – Further to this some of the providers of such services have used mechanisms for reducing the risk even further, for example Octopus, the leading solution provider in this area has a capital preservation product which aims to provide an annual return of 3%. In this respect it is possible to contemplate an investment which produces a low capital risk, a reasonable annual return and full IHT saving benefit. Another ‘pitfall’ is the fact that the IHT qualifying position does not arise for 2 years: this is an absolute position, there is no taper, no staging, it is 2 years or nothing. However in most cases 2 years is a reasonable timeframe to expect to live and therefore for most people the ‘qualifying’ period is short, not long. Compared to other IHT mitigation possibilities it is very short. There is an added benefit: the capital value remains available to the investor to use at any time in the future; it is not locked down or given away. If required the capital is accessible either in full or in part; clearly though any withdrawal of capital would reduce or lose any IHT benefit accrued on that amount. Another way to look at this, when looking at the risk in particular, is that even if the investment goes down in value as long as it doesn’t drop by more than 40% you are no worse off. 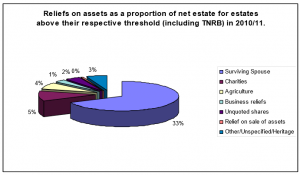 Shockingly, according to the Office of National Statistics only 1% of Estates claimed Business Protection Relief in 2010/2011! In summary, this type of investment is highly effective as a saving against future possible Inheritance Tax. However, there are risks and the nature of the investment may not suit every situation of individual requirement. This makes taking specialist advice around these possibilities as an absolute pre-requisite before any action is taken. Be sure to seek advice.